We all know very well that many times on many occasions you may have written a WhatsApp message, and realized that you have written something that you did not want to write and send, as this simply happens due to the spell checker. Hence, if you are tired and want to get rid of it, then don’t worry, as here, we will show you all that how we can turn off autocorrect or predictive text on WhatsApp (both iOS and Android). Many times you may have written a WhatsApp message, and realized that you have written something that you did not want to write and send, as this simply happens due to the spell checker. As the speed at which we usually write, even while we walk, the spell checker can simply make at any time write certain words or phrases that we did not want to write. Hence, to avoid this, let’s show how to disable the spell checker in WhatsApp. If at some point you have considered deactivating the spell checker in WhatsApp, then let me clarify that the well-known and the world’s most used instant messaging application, of course, WhatsApp does not offer this option. 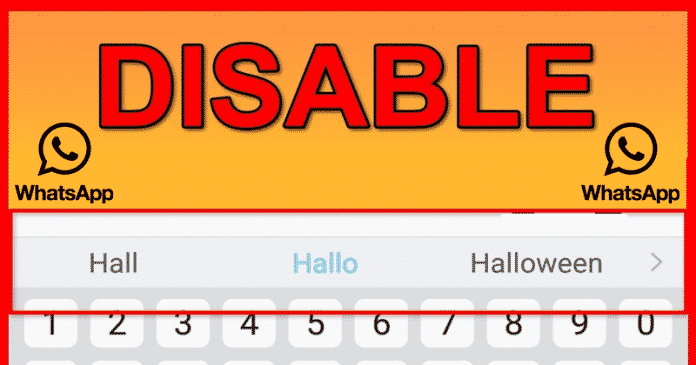 However, now if we talk about the spell checker, then it is basically a feature of our device, not the application itself, therefore, we will have to disable the spell checker from the settings of the mobile simply to get rid of it in WhatsApp. So, now without wasting much time let’s get started and simply explore the whole tutorial that we have mentioned below. If we have a mobile with the iOS operating system, all we have to do to disable the spell checker is simply go to the system settings. Then in the General option, simply access the keyboard. Once there, we will find different options or adjustments among which we have to find Autocorrection. Next to that option appears a slide switch that is the one that we have to slide to the off position simply to deactivate this option. That’s it, now the above step will simply deactivate the auto-corrector in WhatsApp. Now we can simply go back to the messaging application, of course, WhatsApp and verify that we have correctly deactivated it or not. But, if you have a device with Android operating system then still the process to disable the spell checker in WhatsApp is quite similar. To do this, simply we have to touch and open the Android settings. Then we have to navigate through the options System –> language and text inputs. Now we will find the keyboard that we have configured in our device. Then simply we have to touch on it and then we will have to look for the option Predictive text or Writing and spell checker. These options can vary from one device to another, depending on the version of Android, device manufacturer that we have, the keyboard we are using and the interface of the manufacturer of our smartphone. However, once we deactivate this option in the system settings, we will find that the auto spell checker is already disabled.